The chart below gives some information about Someland’s main export performances in 2005, 2015, and its future prospect in 2025. Write a report for a university lecturer describing the information delineated in the graph. 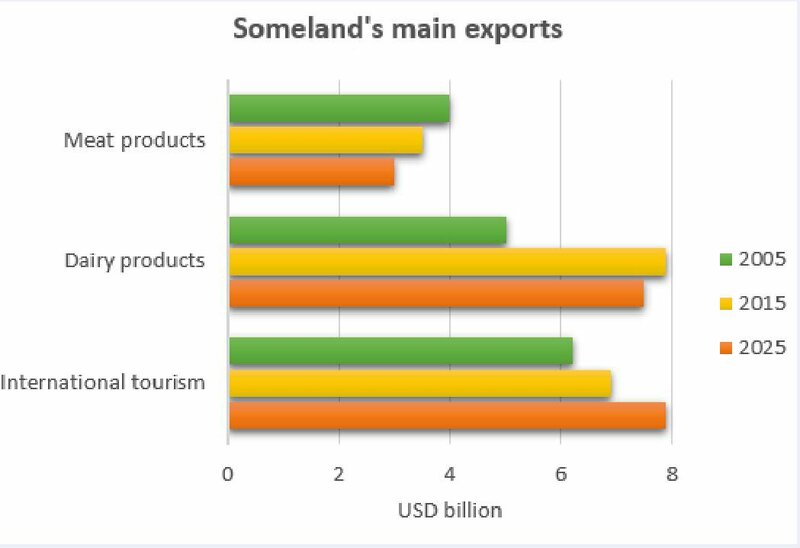 The bar chart below shows some information about Someland’s main export performances in 2005, 2015, and its future prospect in 2025. There is a slight decline in meat products between these years from four billion dollars to approximately three billion dollars. On the other hand, there is a considerable increase in international tourism from about six billion dollars in 2005 to around eight billion dollars in 2025 which we can come to a conclusion that international tourism has a bright future based on these statistics. In addition, we can see clearly that there is a significant fluctuation in dairy products in these years. There is a noticeable increase from 2005 to 2015. However, there has been a downward trend after this period of time. To conclude, we can realize that Someland should invest more in international tourism because its future is clear and it will increase Someland’s profits. They can also change their strategies for meat and dairy products in order to get more profits. You could also say: Unlike meat products, the rate of international tourism has undergone an upward trend. More concerted efforts must be made to improve the rate of meat products in Someland. You have 20 minutes for this task. Your essay should consist of at least 150 words. 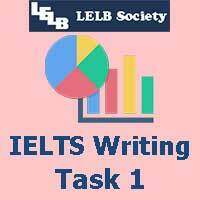 The IELTS Writing Task 1 is an information transfer task, which requires you to write an accurate account of some information presented in graphic form, for example, a graph, table, or some form of a pictorial representation of data. Your addressee is a university lecturer. It is important to read the instructions closely to specify the main focus of your report. Make sure to spend around 3 to 5 minutes planning and organizing your answer. That is to say, do NOT start writing immediately. During this pre-writing time, try to analyze the delineated data carefully. In the exam, you can write notes on the illustration and in a clearly defined space on the front of your answer paper. Your notes could be in abbreviated forms in order to save time. Remember that your notes are personal and won’t be assessed. During planning, decide which significant details will be discussed to reflect the task requirements. While planning your task, you should determine the time period so that the correct tense is used. It is recommended that you start your IELTS Writing Task 1 with a restatement of the keywords in the instructions. In so doing, you will give a broad overview of the details in the pictorial form. You should write one clear sentence to introduce the illustration. After your general introduction, you should write one or two sentences to indicate the relationships between the data or demonstrate a trend. Write more sentences to provide a more in-depth account of the data that transcends your general statement. How to Analyze the Graph? Do not try to describe the graph in a linear or sequential order. Instead, you must develop a nonlinear and profound understanding of the data. Since the data with a pictorial form are not accessible to your addressee, who is a university lecturer, you ought to come to a conclusion to make sense of the whole data. In your concluding paragraph, you can use the notes you took while analyzing and organizing the data in your pre-writing activity lasting for 3 to 5 minutes. You should write one sentence to conclude your writing. As it is typical of any writing task, it is strongly recommended that you proofread your own report for possible mistakes.
? Study the growing archive of IELTS Writing Task 1 Samples.